Here you will find 25 of our most popular crock pot recipes. We have over 1000 recipes on our site but these are the crock pot recipes that you love the most! Finding a great Crock Pot recipe is so much fun. Here are 25 that our followers just can’t live without. Crock Pot Sausage, Sauerkraut and Potatoes-people love this recipe. It’s easy, it’s very few ingredients and it’s great comfort food. Crock Pot Coca Cola Pork Chops-these chops are so tender, you’ll love them. Crock Pot Cabbage and Ham-we love this recipe! It’s easy and so good. Crock Pot Hamburger and Beans Supreme-this recipe makes a lot and is perfect when you have people over to watch a ballgame or entertaining family. Crock Pot Santa Fe Stew-you can serve this stew two different ways and both are fantastic. Slow Cooker Cabbage Fiesta Soup-this soup is always a hit! Crock Pot Sausage & Veggies with Peppers-this is a hearty meal of comfort food. Crock Pot Pulled Pork Barbecue-This recipe is a huge favorite on our site. It has great reviews. Crock Pot Manwhich Chicken-most people think Manwich is just for ground beef but try this recipe using it on chicken. You won’t be disappointed. Crock Pot Pork Roast and White Beans-great comfort food! Slow Cooker Country Style Ribs-if you love ribs, you’ll love this slow cooker method for country style ribs. Slow Cooker Sausage, White Bean and Pasta Soup-this is a fantastic soup that is always a hit. 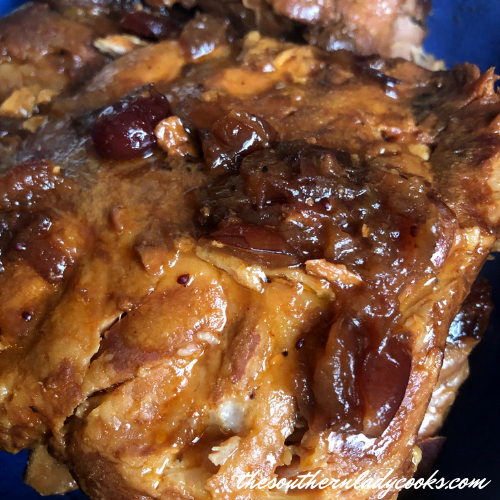 Crock Pot Pineapple Cranberry Chops-the pork chops are so tender and the gravy is wonderful. Crock Pot Steak and Gravy-this is the perfect dish to serve on a cold day! Crock Pot Barbecue Chicken Breast-this recipe will make your mouth water. The sauce is so good and really give the chicken a spicy flavor. 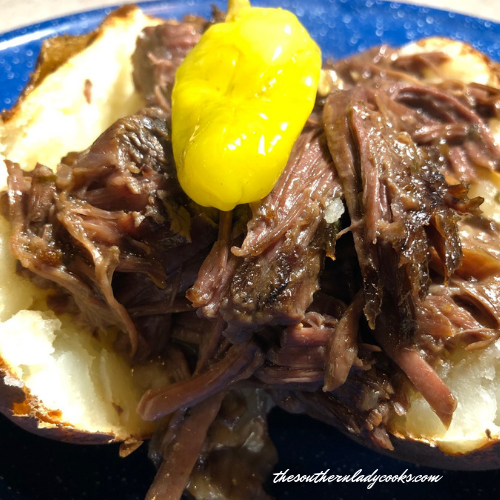 Crock Pot Roast Beef-This is one of my families all time favorite meals. It’s absolutely delicious and so easy. Crock Pot Beer Brats and Sauerkraut-this recipe is so good. It’s perfect for tailgating or any event. It’s so easy and really delicious. Crock Pot Mushroom and Onion Chops-this recipe is to die for. Just make it and thank us later. Slow Cooker Juicy Beef Roast-this beef roast comes out so tender. We love this recipe because it’s so versatile. Crock Pot Corned Beef and Cabbage-this corned beef and cabbage recipe is great because it’s made in the crock pot. Crock Pot Round Steak with Peppers and Onions-a family favorite! Slow Cooker Zesty Chicken-this whole chicken recipe will melt in your mouth. Cheesy Crock Pot Pasta with Italian Sausage-this is so easy and you don’t even have to cook the noodles. Crock Pot Ham-I love making a ham this way. It is perfect for the holiday’s but just as good to make anytime. Hot Artichoke and Sausage Dip-this is such a great appetizer. We could eat it everyday. I hope you’ve found something you can’t wait to make for your family and friends. If you’re interested in our other popular recipes, click here. If you want to learn more about our journey with The Southern Lady Cooks, read more here. These recipes look so good and easy. My question is do you have a recipe for beef pot pie not chicken? You can use the chicken pot pie recipe but just make it with beef.